It is astonishing to see the amount of pet owners who leave their pet in a car on a hot day to "quickly" run into a shop or complete an errand. 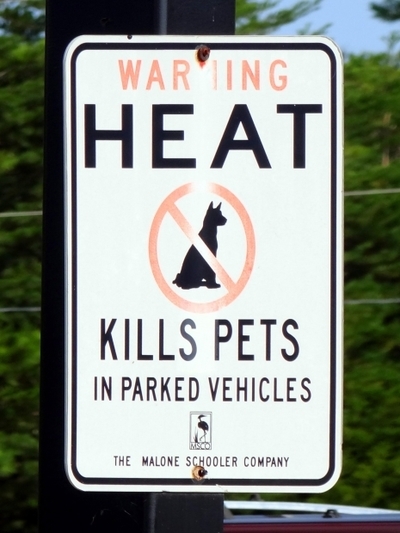 Is it ever ok to leave a pet in a car on a hot day, or indeed at anytime? Would you confront an owner if you noticed they had left their pet locked in a car on a hot day? Absolutely, I would have a word with them. Sometimes it's ignorance on their part and a gentle nudge in the right direction can make all the difference. Sometimes it's just plain selfishness and then nothing will help but at least I know I've done my best. I would do more than confront the person. I would call the police so the animal could be rescued, and the police could deal with it. Yes, definitely. However, owners do not always react well to a random person confronting them. Sometimes it is best to go to the management of the shopping centre, or wherever the owner may be, and have them make a call throughout the centre, asking where the owner is. This way the owner becomes embarrassed and likely will not do it again. Having said that, management may not always do this for you and so your other options are to call the RSPCA or the police. I'm not one to necessarily confront the owner ( you never know if you are setting off a loose cannon) but an anonymous call to the RSPCA or police with number plates is definitely something I would do. They are the right authority to take action. Have you ever had a bad experience at the hair salon?